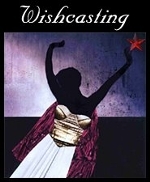 It's Wishcasting Wednesday so the gorgeous soul Jamie Ridler is inviting us to cast our wishes into the universe and support others' wishes. Today Jamie asks, "How do you wish to be brave?" I wish to be brave in my spiritual growth. My footing is often unsure in this area. I'm learning to trust and have faith, but that can be a hard thing to do. I'm trying to hear what God wants to tell me and follow His lead. Writing any mentions of religion in such a public way is epically scary, particularly when I'm still figuring out what I believe. This is why I wish for bravery. To be brave enough to continue this journey, learn what I need to learn, and, if so inclined, be able to share my experience. I can really relate to what you write. As you wishe for yourself, so I wish for you also. As you wish for yourself, I ardently wish for you as well. Be brave, we will be brave with you. Sherri, as you wish for yourself, I wish for you as well.